On March 25, 1865 Lee made one final attempt to break the Siege of Petersburg by ordering forces commanded by Major General John B. Gordon to attack Fort Stedman, a Union fortification in the siege lines surrounding Petersburg. Gordon’s pre-dawn attack was successful initially, but blistering Union counterattacks forced the Rebels back inside their lines. Some historians consider the Battle of Fort Stedman as the end of the Petersburg Campaign. Others think of it as the beginning of the Appomattox Campaign. The Appomattox Campaign was the final campaign of the Army of Northern Virginia during the American Civil War. It consisted of a series of engagements during late March and early April 1865 that led to the General Robert E. Lee’s surrender at Appomattox Court House, Virginia on April 9 and the official disbandment of the Army of Northern Virginia on April 12. Many historians consider March 29, 1865 as the beginning of the Appomattox Campaign. 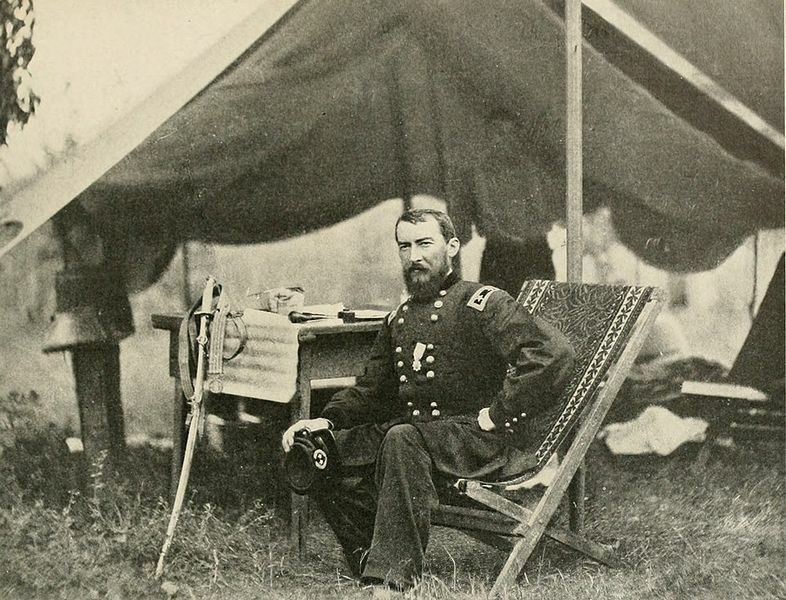 On that date, Grant opened his spring offensive against Lee’s army by ordering Major General Philip Sheridan’s cavalry (freshly returned from the Shenandoah Valley) and Major General G.K. Warren’s 5th Corps to attempt to turn Lee’s right flank at the Battle of Lewis’s Farm. Two days later the action resumed at the Battles of White Oak Road and Dinwiddie Court House as Lee shored up his right wing to halt the federal Flanking maneuver. On April 1 Sheridan and Warren continued their offensive, with a major victory over Major General George Pickett’s forces at the Battle of Five Forks. The loss of that strategic crossroad further threatened Lee’s already limited supply line. Encouraged by the Federal victory at Five Forks, Grant ordered a general assault on the Confederate entrenchments the next day. The Union onslaught at the Battle of Petersburg III, forced Lee to abandon his entrenchments around Petersburg, which led to the fall of the Confederate Capital at Richmond. Three minor engagements took place during the next three days at Sutherland’s Station, Namozine Church, and Amelia Springs. On April 6, the Federals scored a major victory at the Battle of Sailor’s Creek (also known as the battle of Sayler’s Creek). There, Sheridan and elements of the 2nd and 6th Corps cutoff Lee’s retreat forcing the surrender of nearly one-fourth of the Confederate army. The battle led Lee to exclaim, “My God, has the army dissolved?” Minor engagements continued for the next three days at Rice’s Station (April 6), High Bridge (April 6-7) and Cumberland Church (April 7) as Grant continued his dogged pursuit. On April 7, Grant initiated communications with Lee regarding cessation of of hostilities.Â Grant informed Lee that because he considered Lee’s situation to be hopeless, he felt it was his “duty to shift from myself the responsibility of any further effusion of blood by asking of you the surrender of that portion of the Confederate States army known as the Army of Northern Virginia.” That night, Lee responded to Grant, disputing the Union general’s assessment regarding the “hopelessness of further resistance on the part of the Army of Northern Virginia.” Nevertheless, Lee went on to inquire about “the terms you will offer on condition of its surrender.” The next morning, April 8, Grant generously replied, “there is but one condition I would insist upon, – namely that the men and officers surrendered shall be disqualified for taking up arms against the Government of the United States until properly exchanged.” He once again invited Lee to meet with him to discuss the surrender of Lee’s army. As Lee was pondering Grant’s proposal, Major General George Custer’s cavalry seized a Rebel supply train at Appomattox Station, denying Lee’s army of vital provisions. Custer also captured Lee’s lead artillery unit and secured the high ground west of Appomattox Court House, directly in Lee’s line of retreat. Despite the fact that Lee’s situation had deteriorated during the day, that night he stated in his response to Grant’s morning proposal, “I do not think the emergency has arisen to call for the surrender of this army. . .” Lee went on to suggest that the two generals meet to discuss terms of peace between the North and South. The meeting was arranged to take place that afternoon at the home of Wilmer McClean at Appomattox Court House. Lee arrived first and Grant followed soon thereafter. By 4 o’clock the two generals had negotiated the terms of surrender and the Appomattox Campaign came to an end. On April 10 Lee delivered a farewell address to his army and on April 12 the surrender was formally concluded. It should be noted that Lee’s surrender did not end the Civil War, as is oftentimes erroneously believed. Hostilities continued in various parts of the South for several months. The Confederate government met for the last time on May 5, 1865 before being dissolved. Union troops captured Confederate President Jefferson Davis on May 10 in Richmond, Virginia. Finally, on August 20, 1866, over one year later, President Andrew Johnson signed a Proclamation—Declaring that Peace, Order, Tranquillity [sic], and Civil Authority Now Exists in and Throughout the Whole of the United States of America.